I might pass out. Altitude training can be a more intense workout, but you have a monitor to measure your Sp02 levels. And if you get light-headed, just step out. It’s only for elite athletes. Wrong! This is great for people of any experience level. It has been shown to help with weight loss, recovery from injury, strength, and cardiovascular performance. Anyone can take advantage of this unique training experience. I’m not going to a high altitude location, I don’t need it. Yes, it helps people acclimate before going to high altitude destinations. However, Altitude Training has also been show to stimulate dramatic physiological changes to people living at sea level. You’re training your body to carry more oxygen and deliver it more efficiently, regardless of your elevation. I’ve got to wear a mask on my face. NO! The entire 650 square foot room is at altitude, no masks required! I don’t have time. Fantastic results have been measured with as little as three hours per week for one month. Have more time, do more. Have less time, you can still see benefits. Considering the proven benefits, the time commitment is relatively small! I can’t afford it. We’ve done everything we can to make this a cost effective tool. You can train for as little as $6.50 an hour. Training in our Altitude Training Room opens up a wide range of benefits and we hope integrating some train high and live low strategies will help you break through plateaus that were previously inaccessible. Olympic athletes train in a very similar altitude room at the Olympic Training Center in Colorado Springs before they compete in places like Rio, which is at sea level! Now YOU can train like an Olympian. Our Altitude Training Room will adhere to the following general schedule so you can plan your training appropriately. The first Sunday of each month will be at 14,000 feet. The 2nd Sunday will be 15,000 feet. The 3rd Sunday will be 14,000 feet. The 4th Sunday will be 15,000 feet. The LAST Sunday of every month will be at a staggering 17,000 feet. Follow us on Facebook to keep updated on the schedule. Bateer S, Tsuneo W, Sohee S, Tamotsu Y, Masao T and Toshio M, 2013. Effect of Hypoxic Training on Inflammatory and Metabolic Risk Factors: a Crossover Study in Healthy Subjects. Czuba M, Waskiewicz Z, Zajac A, Poprzecki S, Cholewa J, Roczniok R, 2011. The Effects of Intermittent Hypoxic Training on Aerobic Capacity and Endurance Performance in Cyclists. Galvin H, Cooke K, Sumners D, Mileva K, Bowtell J, 2013. Repeated Sprint Training in Normobaric Hypoxia. ISSN 0362-1197, Human Physiology, 2007, Vol. 33, No. 2, pp. 199–206. © Pleiades Publishing, Inc., 2007. Changes in Autonomic Response and Resistance to Acute Graded Hypoxia During Intermittent Hypoxic Training. Kon M, Ohiwa N, Honda A, Matsubayashi T, Ikeda T, Akimoto T, Suzuki Y, Hirano Y, Russel A, 2014. Effects of Systemic Hypoxia on Human Muscular Adaptations to Resistance Exercise Training. Meeuwsen T, Hendriksen I, Holewijn M, 2001. Training-induced Increases in Sea-level Performance are Enhanced by Acute Intermittent Hypobaric Hypoxia. Train for an hour on us. 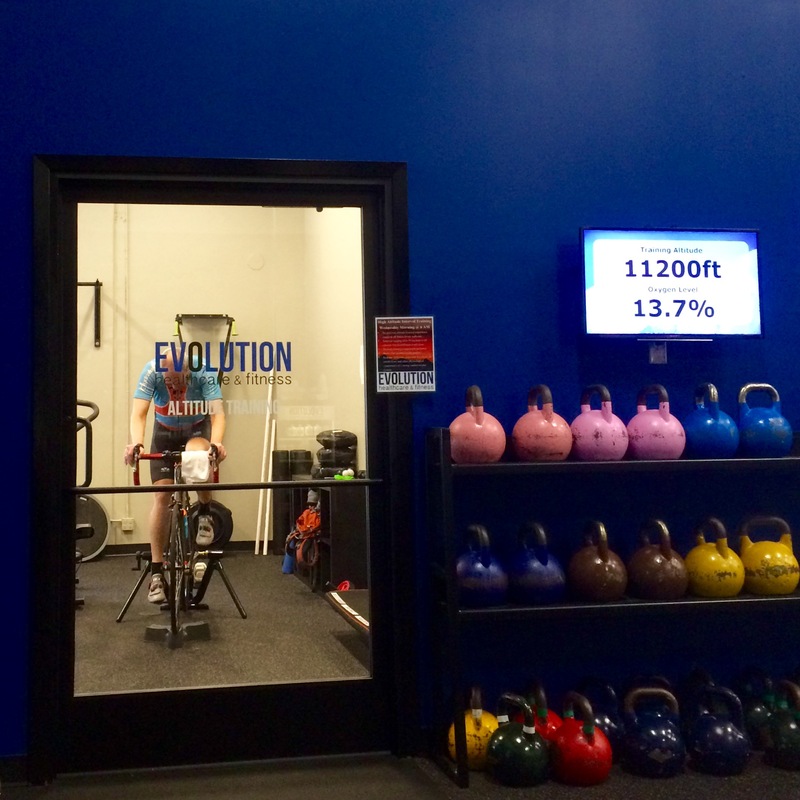 New clients at Evolution get a FREE one hour trial in the Altitude Training Room (local residents only). Give us a shout or just come in and get you one hour trial. Remember, we’ve eliminated initiation fees and membership fees! Just want to purchase a single hour? Click HERE. What’s the ClimbStation™? Learn more HERE! The Everest Summit II unit allows you to get up to ~20,000 feet of simulated altitude. Reservations to use the unit can be made by calling 971-236-7610, Option 2. Just want to purchase a single hour? Click HERE.